This will be one of those blogs that actually needs to be read in its entirety. You can't just read the headline and immediately know what I'm arguing. So before your eyes pop out of your head and you type comments attacking me, please read the piece first. Then you can do all of that stuff. Recently, Chris Sale was named Opening Day starter for the Boston Red Sox. 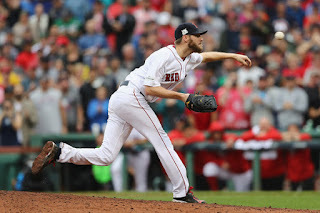 Obviously it was going to be him; he was the Red Sox's best pitcher last season and qualifies in every category to earn the title of number one starter heading into 2018. Typically, being named Opening Day starter means nothing. But for one hurler on the Red Sox's starting staff, being named the pitcher for game one could have meant something this year. It's no secret that Price has had a rough past two seasons here in Boston since signing his lucrative seven-year, $217 million contract (opt-out clause after the 2018 season). From the Dennis Eckersley incident last summer to simply under-performing, Price just can't seem to keep one foot in front of the other. With the 2018 regular season fast approaching, it's a chance for Price to restart his career here in Boston. There's a new manager in Alex Cora. Price dazzled in the 2017 postseason coming out of the bullpen: 6.2 innings, five hits, six strikeouts, and no earned runs. Thus far in spring training, he's 2-0 with nine innings pitched, four hits, nine strikeouts, and two earned runs. But the pitch for Price to start on Opening Day isn't based in stats, so much as its based in mentality. If Price were to start Opening Day, Cora would be giving him a clear rock to base his restart on. He'd be given the confidence of a "number one" starter -- something that could be necessary to jumpstart his success in Boston. With Price starting on Opening Day, the person to reap the most benefits wouldn't even be Price. It would be Sale. Obviously Sale is the more qualified of the two to start the first game. Cora could sit Sale down and tell him that by sacrificing his Opening Day start for Price, he's really the leader of the staff to help Price get off on the right foot. Sale's a huge team-first guy and would wait one day for his first start of the season to give Price the boost of confidence. He'd also get some air pumped into his tires by being the leader of the staff. Overall, Sale starting on Opening Day and Price going game two isn't a bad move. But if starting on Opening Day would boost Price's low confidence, it should've been done.